Humans rule the world. There is no debate about that, but we certainly shouldn’t think we are distinct in many area when comparing us with animals. Think we are the only creatures on the planet with a sense of humor, or have a culture, or show emotions such as love? Think again. We also are quite limited when comparisons to physical ability arise. We can’t run as fast or jump as high or see as far as many animals. But we can run longer, which is good since it helps us avoid being food for some of the less friendly animals out there. 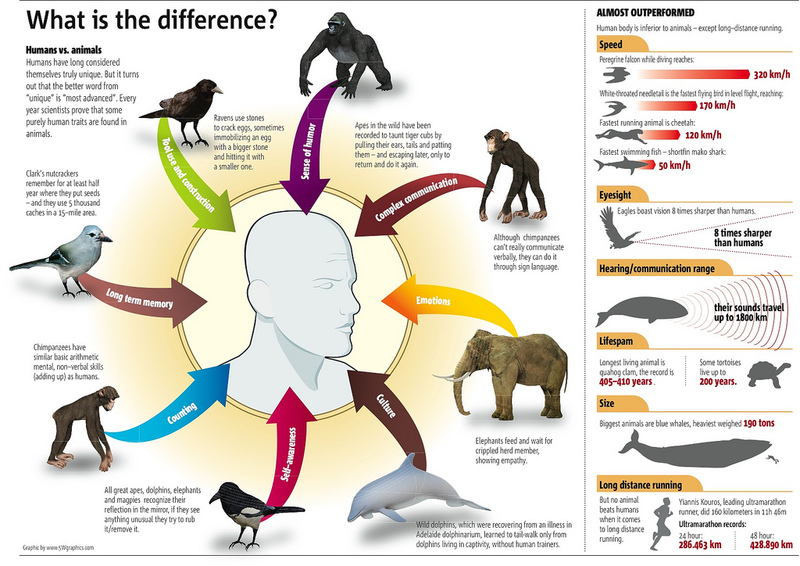 A simple animal infographic showcasing some interesting animal facts. Not an infographics meal, but a nice snack just the same.